Searching for fonts that look like Grota? Look no further! 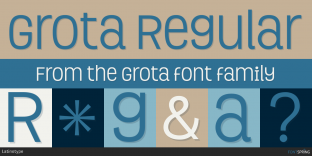 Here you will find fonts that look like Grota. Use the selector above to match other fonts in the family. Worry-Free! Rothwell Typodermic Fonts Inc.
Worry-Free! Pupcat Typodermic Fonts Inc.
Worry-Free! NK57 Monospace Condensed Typodermic Fonts Inc.
Worry-Free! NK57 Monospace Semi Condensed Typodermic Fonts Inc.